In a previous post, I neglected to mention one of the most charming things I discovered about coffee in Sweden, the tradition of fika. Fika is an afternoon coffee break, often with sweets and baked goods. It's similar to English tea time, but does not have such a formalized background. In fact "fika" can mean a break of any kind, or even a little date. But usually the term refers to a break in the afternoon for refreshment, the chief form of which is coffee. A gentleman I met in Stockholm told me that comes from the days when coffee was still considered déclassé, a drink for the rabble. People would refer to coffee time as "fika" to avoid arousing suspicion. A simple code for a simple tradition. Now everyone in Sweden enjoys fika, and kaffi at their fika. Thanks to my friend Suzanne, who helped remind me of this little morsel during our own Seattle-style fika yesterday afternoon. The speeches that were given at the Nordic Barista Cup in Oslo, on the other side of the fat part of Scandinavia, are available on their website. I encourage you to listen to all three, by Stephen Vick, George Howell, and Erling Dokk Holm. Scroll down past the Harry Potter pictures to find links to the audio. I will have something specific to say about George Howell's talk in my next post. Scandinavia is the epicenter of the world quality coffee movement. Last week I was in Stockholm drinking coffee and researching my Nordic roots. At the same time, on the other side of the great peninsula, the Nordic Barista Cup was taking place in Oslo. I've never been to the Nordic Barista Cup, but it's very high on my list of coffee to-do's. Baristas and coffee professionals from Iceland, Norway, Sweden, Denmark, and Finland get together once a year and have all kinds of coffee events and parties. Teams from each nation dress up in matching jumpsuits like Olympic athletes, and snapshots from the various parties always show beautiful people having a lovely time. This year, barista magazine had some top-notch blog coverage. As for me, I had a lovely time island-hopping in Stockholm. I did some interesting work for Pernod-Ricard, the spirits company. Absolut — a very Swedish vodka, of course — is one of their brands, and that's what took us to Stockholm. But I wasn't doing any work on vodka, but actually on Kahlúa. I did some very interesting blind tasting of various coffee liqueurs. They are most decidedly not all the same. Some have some extremely disagreeable chemical-rubber tastes underneath all that sugar. I hope to be able to share the outcome of the work I did there on the blog soon; but for now I have to keep it somewhat under wraps. For you New Yorkers out there, I thought you might get a kick out of this picture. 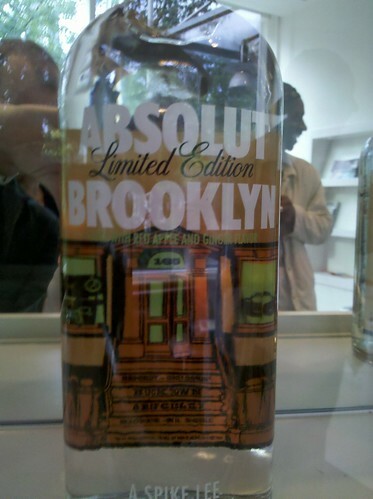 It's a collaboration Absolut did with Spike Lee (no joke). I uploaded some more pics on my flickr page. Not much coffee related (except the awesome french press hotel coffee I got which made my day on Thursday), but there's some pretty rainbows. Finally, I shot this video at dinner (amazing food at this restaurant). You can't see anything cause the light is too low. But you can hear what my Swedish friend, Frida, thinks of Norwegian coffee.